Offering free Wi-Fi, this hostel is situated in the centre of Moscow. 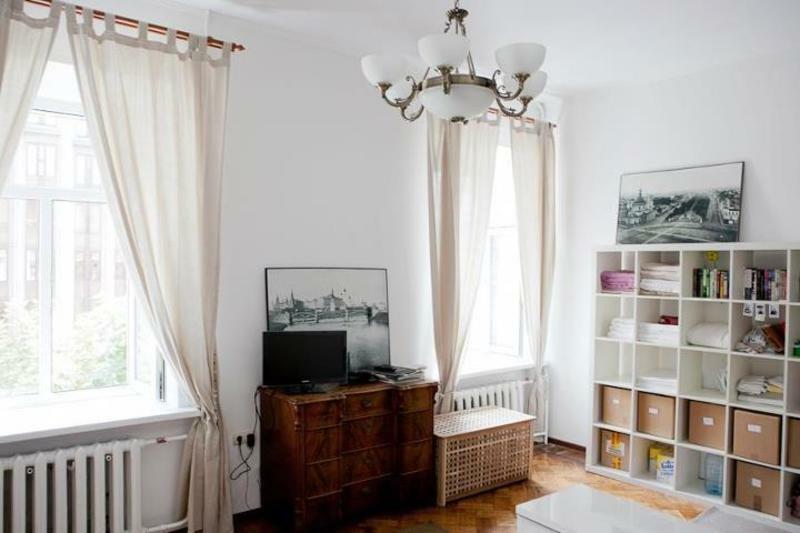 It offers a fully equipped kitchen, and Tverskaya and Chekhovskaya Metro Stations are just a 5-minute walk away. The simple rooms at the iVAN Hostel are decorated with wooden furniture, and slippers are provided. Each room has shared bathroom facilities, and a safety deposit box. For cooking you can use our fully equipped modren kitchen. We provide coffee since 8.00 till 10.30, tea is available during the whole day. Restaurants can be found within a 5-minute walk of the iVAN. The Stanislavskiy Theatre is a 2-minute walk from the iVan Hostel. Red Square, the Kremlin and the Bolshoi Theatre are a 10-minute walk away. Belorusskiy Train Station is just 2 stops from Tverskaya Metro Station. Sheremetyevo Airport is 28 km from the hostel and Domodedovo Airport is 45 km away. ?Sheremetyevo: Take Aeroexpress to Belorussky (???????????) train station (http://www.aeroexpress.ru/en/sheremetyevo.html). Enter the metro at Belorusskaya (???????????) station (green line), go two stations down to Tverskaya (???????? ), and switch to Chekhovskaya (?????????). ?Vnukovo: Take Aeroexpress to Paveletsky (??????????) train station (http://www.aeroexpress.ru/en/vnukovo.html). Enter the metro at Paveletskaya (??????????) station (green line), go three stops up to Tverskaya (???????? ), and switch to Chekhovskaya (?????????). ?Domodedovo: Take Aeroexpress to Kievsky (????????) train station (http://www.aeroexpress.ru/en/domodedovo.html). Enter the metro at Kievskaya (????????) station (brown line), go one stop up to Krasnopresnenskaya (????????????????? ), switch to Barrikadnaya (??????????? ), go one stop down to Pushkinskaya (?????????? ), and switch to Chekhovskaya (?????????). ?Kursky: Enter the metro at Chkalovskaya (??????????) station (light green line), go two stops up to Trubnaya (??????? ), switch to Tsvetnoy bulvar (??????? ??????? ), and go two stops down to Chekhovskaya (?????????). ?Leningradsky/Kazansky/Yaroslavsky: Enter the metro at Komsomolskaya (?????????????) station (brown line), go two stops up to Novoslobodskaya (?????????????? ), switch to Mendeleevskaya (????????????? ), and go two stops down to Chekhovskaya (?????????). ?Savelovsky: Enter the metro at Savelovskaya (???????????) station and go three stops down to Chekhovskaya (?????????). ?Kievsky: Enter the metro at Kievskaya (????????) station (brown line), go one stop up to Krasnopresnenskaya (????????????????? ), switch to Barrikadnaya (??????????? ), go one stop down to Pushkinskaya (?????????? ), and switch to Chekhovskaya (?????????). ?Paveletsky: Enter the metro at Paveletskaya (??????????) station (green line), go three stops up to Tverskaya (???????? ), and switch to Chekhovskaya (?????????). ?Belorussky: Enter the metro at Belorusskaya (???????????) station (green line), go two stations down to Tverskaya (???????? ), and switch to Chekhovskaya (?????????). If you are arriving at night (after 1am), we recommend ordering a safe and inexpensive taxi via our hostel. We strongly advise you against taking the taxi during the day due to extremely heavy traffic and a huge amount of traffic jams. We also warn you that a bus trip from the airport to the city can take up to 3 hours. We strongly advise using the quick and easy way - Aeroexpress trains. Follow the sign saying "????? ? ?????". Go up three escalators, through the glass doors, and turn left. Then up the stairs to the left, and you will exit on the street. After exiting turn right and go to the traffic light. Cross the street ("??????? ?????????" street) and turn right. Go straight along the left side of the street. Turn left to the "?????????? ????????". The building on the corner is where the hostel is. Go past the first entrance and go to the second one. Put "23" on the number pad, and we will open the door. Go upstairs following signs on the walls.